We weren't much of a convenience food family when I was growing up. I think it was partly because convenience foods were more expensive and we couldn't afford to eat them, and the other part was that in those days most women were reluctant to be seen as not taking care of their families by cooking for them, even those like my mother who did not like to cook. On the rare occasion when we did have frozen food for dinner, it was either Swanson or Banquet TV dinners, whichever had been on sale and was cheapest. And even though they weren't terribly good, it was always a treat to get that compartmentalized aluminum tray and pull back the foil covering to reveal the fried chicken, salisbury steak, or turkey dinner - with dessert! - that lay hidden below. The vegetables were tasteless mush, of course, but so were my mother's so there was nothing lost there. But there was the meat, the potatoes and gravy, and that little brownie or apple crisp of a dessert so it was all good. I don't know when I became aware of Stouffer's. That's what some of my friends' mothers had in their freezers. Their entrees were much more expensive than Banquet and Swanson's, so we never tried them. But even without knowing anything about them I knew they were of a much better quality than what we were eating. So I would have assumed that their ingredients were more natural, less processed, and healthier as well. And they may well have been, back then. Not so much now. The tagline on their ad: "Stouffer's - made from real ingredients with no preservatives." Blanched Macaroni Product (Water, Semolina), Tomato Puree (Water, Tomato Paste), Part Skim Mozzarella Cheese (Cultured Milk, Salt, Enzymes), Beef, Water, Dry Curd Cottage Cheese (Cultured Skim Milk, Enzymes), Modified Cornstarch, Salt, Modified Food Starch, Bleached Wheat Flour, Dehydrated Onions, Sugar, Spices, Skim Milk, Flavor (Yeast Extract, Soy Sauce [Soybeans, Wheat, Salt], Partially Hydrogenated Cottonseed and Soybean Oils, Dextrose), Flavors, Yeast Extract, Dehydrated Garlic, Carrageenan. Warnings: Contains milk, soy, wheat ingredients. Here's what bugs me about this kind of tagline. Everything is made from real ingredients; not to get too philosophical about it but everything that exists is real, even if it is synthetic, or bad for you. Partially hydrogenated cottonseed and soybean oils (transfats, in case there's anyone out there who still doesn't know that) are real ingredients. 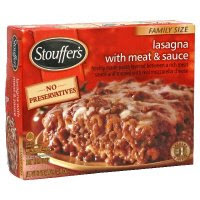 Technically, what Stouffer's is claiming is true. They may be bad for you, but as far as I know they are not preservatives. So where does that leave us? When I first started making these "Ad of the Week" posts, I was afraid that I was going to run out of products about which to write. I don't know whether to be glad or disturbed that the more I look, the more I find. And I have to give most of these companies credit. They have found ways to imply that their products are healthy and wholesome without actually lying. I guess that's their right. Caveat emptor. I guess the onus is on us to look beyond the ad. After all, it's all right there on the label.